Trying to change the political tide amid criticism over his record-setting Trump Shutdown, Donald Trump offers token measures to get $5.7 billion for his Wall with Mexico. Trump closed the Federal Government at midnight on December 21, refusing a Senate bill which included $1.3 billion for border security but no money for his $25 billion Wall. He has rejected a similar measure this month from the Democrat-controlled House, and he has overruled his negotiators — including Vice President Mike Pence — insisting that they demand the full $5.7 billion. Reading a teleprompter script in a televised speech on Saturday, Trump offered a three-year extension of protected status for about 800,000 “Dreamers”, who came to the US as children with undocumented immigrant parents. He did not mention that he ended all protection for the Dreamers last March, revoking the order by Barack Obama — Deferred Action for Childhood Arrivals — which allows the young immigrants to study, work, and serve in the US military. Trump’s revocation faces a legal challenge, with the Supreme Court yet to rule in the case. Nor did Trump recall that last March he initially accepted a path to citizenship for the Dreamers in return for Wall funding. He withdrew the acceptance when he was criticized by hard-line White House advisors conservative commentators. Trump also revoked Temporary Protected Status, which offers crucial protections from about 300,000 immigrants from some Latin American and African countries, which he described as “shitholes”. A federal judge blocked the revocation last October. In Saturday’s statement, he offered to restore protection for those affected in return for The Wall money. The speech came from talks that Pence and Trump’s son-in-law Jared Kushner have held with Republican legislators including Senate Majority Leader Mitch McConnell, who has refused Senate consideration of the House bill reopening the Government . Trump said McConnell will quickly arrange a Senate vote on his proposal. But Democrat leaders immediately declined. Senate Minority Leader Chuck Schumer described the maneuver as “not a compromise but more hostage taking”. Trump’s script appeared to deal with criticism by muddling the portrayal of The Wall. Trump emphasized that “this is not a 2,000-mile concrete structure from sea to sea” because “much of the border is already protected by natural barriers such as mountains and water”. He recast his favorite project as “a powerful and beautifully designed see-through steel barrier on our southern border”. Trump tried to seize credit for border security measures in the bill passed by the Senate before the Government closure, and in the House version after it. 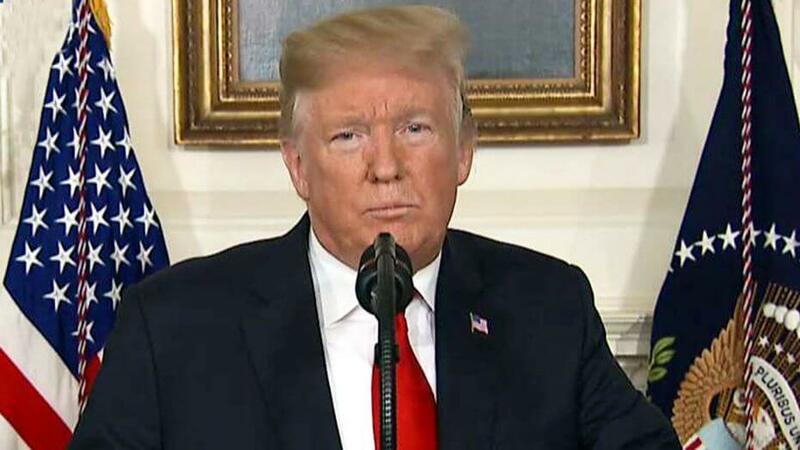 He proposed $800 million for “humanitarian assistance”, $805 million for drug detection technology, as well as funding for 2,750 more border agents and law enforcement officials and 75 new immigration judge teams. House Speaker Nancy Pelosi noted that Democrats had worked for “new drug, weapons, and contraband scanning technology at official ports of entry” and “filling the more than 3,000 vacancies for customs officers”. She said she will table legislation in coming days with another $1 billion for border security, including $563 million for 75 new immigration judges and support staff. Meanwhile, the Trump Administration — facing criticism from hardline conservatives for being weak — already tipped off that its proposal had been watered down from last March, restricting the status of Dreamers.